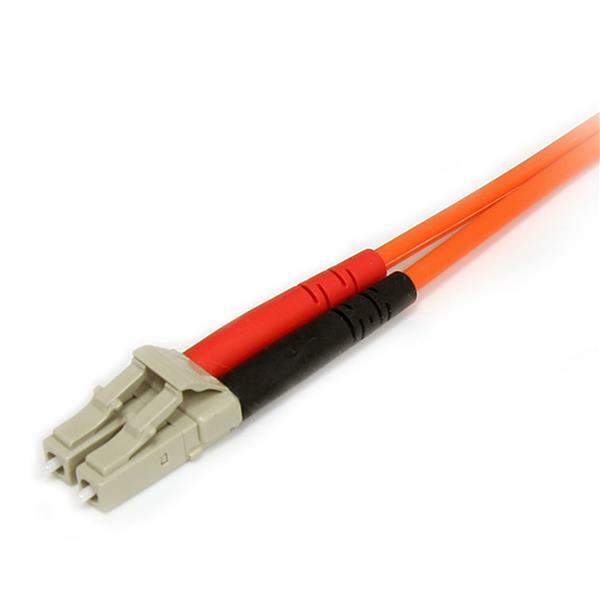 The FIBLCSC5 5-meter (16ft) Multimode 62.5/125 Duplex Fiber Patch Cable is terminated with one LC (male) connector and one SC (male) connector, to provide the necessary connection between fiber networking devices for high-speed, long distance networks. This LC-SC patch cable is housed in a LSZH (Low-Smoke, Zero-Halogen) flame retardant jacket, to ensure minimal smoke, toxicity and corrosion when exposed to high sources of heat, in the event of a fire. Making it ideal for use in industrial settings, central offices and schools, as well as residential settings where building codes are a consideration. To ensure optimum performance, our multimode fiber duplex cable is individually tested and certified to be within acceptable optical insertion loss limits for guaranteed compatibility and 100% reliability. 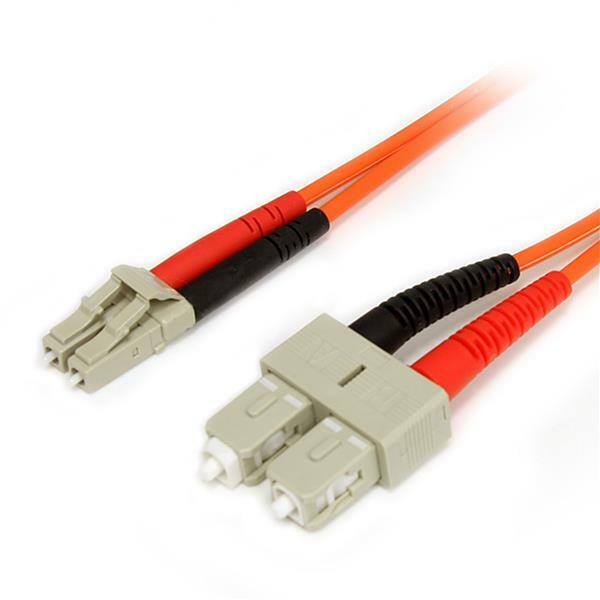 Backed by Lifetime Warranty, our LC-SC Multimode Fiber Patch cable is guaranteed to provide long-lasting dependability, and top quality performance. How can I tell which fiber cable I will need for this fiber media converter? Mode: Single Mode or Multi Mode. Wavelength: For example, 850 nm, 1310 nm, or 1550 nm. Note: The above properties cannot be converted or changed by a cable. When you select a cable, make sure that the cable ends (for example, LC, SC, ST, or MT) match the fiber media devices. Simplex and duplex ends are available for most connector types. Simplex cables have the connectors separate, where duplex cables have the transmit (TX) and receive (RX) connectors joined together. 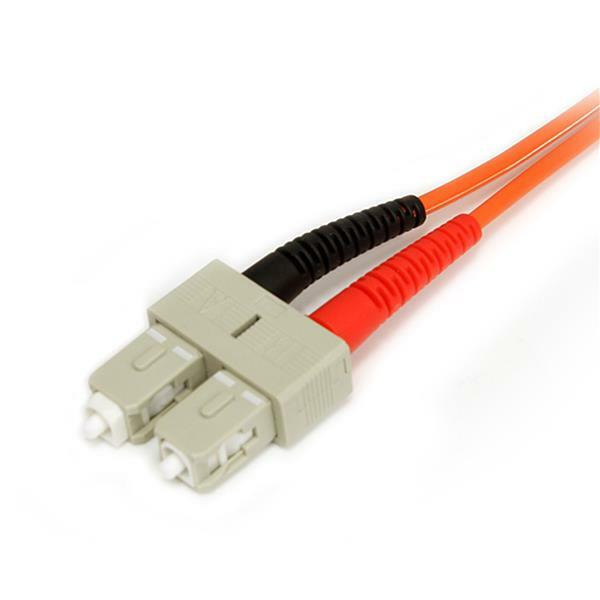 StarTech.com fiber media devices are compatible with simplex and duplex connectors. It does not matter which diameter or OM classification the cable uses, as long as it meets the mode requirement. Fiber media converters can be used to convert a standard Ethernet connection to a standard fiber connection, or can be used to extend a copper Ethernet network. When you use fiber media converters to extend a copper Ethernet network, make sure that the same fiber standards are being used on either end of the fiber network. What is the difference between UPC and APC connectors, and what do StarTech.com cables use? UPC and APC are fiber cable connector types. UPC (Ultra Physical Contact) connectors have a fiber connector end face that has been polished to be dome-shaped. This results in light that can be reflected straight back to the source. APC (Angled Physical Contact) connectors have a fiber connector end face that has been polished at an eight degree angle. This results in a reduced amount of light that is reflected between the two connected fibers. StarTech.com fiber cables use UPC connectors. Use the network devices and network cables in another setup to see if the problem is with the components or the setup. Use different network devices and network cables in your setup to see if the problem persists. Ideally, you should test a component that you know works in another setup. If the link LEDs are not illuminated or there are not any LEDs present, you will need to troubleshoot your devices. Alternatively, you can also use a network cable tester, such as the REMOTETEST or LANTESTPRO.